According to Google Maps, the K-8 school is a six-minute drive and just 1.6 miles from M-A. At its entrance, a wooden white board proudly displays the red and gold words, Wildcats. Willow Oaks School is one of eight other schools in the Ravenswood City School District (RCSD). After eighth grade, many students head to M-A. Some of them played instruments last year like flute, clarinet, saxophone, and trumpet in their school band. Freshman Felipe Marginez used to go to Ronald McNair, one of the eight schools in the RCSD. Now at M-A, he drives to school every morning to attend his first class of the day, Concert Band. Marginez has been playing clarinet for approximately one year and three months. He is one of only four musicians to ever graduate from the RCSD and join one of M-A’s band classes. Four mornings a week, Marginez attends M-A’s Concert Band class taught by Kent Kurrus. Kurrus has been teaching at M-A since 2006, but just three years ago, he became the Music Consultant and mentor for music teachers in the RCSD. There he helped build the district’s music program from scratch. This is the first year in which students graduating from the RCSD joined Kurrus’s bands, two in Orchestra, with Marginez in the Concert Band. Kurrus has played music since elementary school. He believes that music develops collaboration and benefits certain parts of the brain. He pointed out that some of the “best students academically” are in his band class. Just like in team sports, band students must contribute uniquely in order to create a performance that flows together. “You learn to work with others. It is difficult to play in a band when you don’t get along with others,” said Kurrus. He wants the Ravenswood children to have that experience as well. Kurrus thinks that as more students from the Ravenswood bands come to M-A, it is important that we support them and include them both inside and outside of class. He has seen how the school is divided at lunch time. Even though M-A’s slogan is Strength in Diversity, “If you go out at lunch you can see the division. People eat lunch with people who come from the same place,” he said. Current M-A mom, Andrea Palmer, is helping to close this division as well. She is the president of the “Ravenswood Project,” that began in 1991. This docent program, led by the Mid-Peninsula League of the San Francisco Symphony, helps teach kids about music and gets them ready for an exciting field trip to the SF Symphony. The “Ravenswood Project” is part of a larger project called Concerts for Kids. According to the symphony’s website, they have hosted thirty-minute concerts for more than 35,000 children in North California each year since 1919. They perform five-minute pieces like songs from “Frozen” for elementary students at Davies Symphony Hall. The “Ravenswood Project” is a musical education program that started out with grades 1-6 at Costaño Elementary School, another school in the RCSD. Now, it includes second and third graders in four of the district’s schools. During six weeks, docent volunteers like Palmer teach and then chaperone the children on their trip to the symphony. “The goal is to give as many students as we can in the [RCSD] exposure to the kind of enrichment experiences that are not as readily available to other students that arrive at Menlo-Atherton,” she said. On one of their visits last week, Andrea Palmer (gray sweater) and Shari Conrad (white coat, also an M-A mom), hold the ends of a plastic tube to show the length of a french horn if unwound. Credit: Andrea Palmer. Palmer is also part of the Symphony’s fundraising program to sponsor the trip. “One of the things that has been a sort of hallmark for the program is that we don’t take them on school buses, we take them on coach buses…It really does make a huge impression on the kids [and] makes it feel like a special day,” she said. Palmer thinks that “it’s difficult for the Ravenswood students to get the experience that would really benefit them … Hillview and La Entrada are both big middle schools. They have the abilities and the size to feed a real orchestra and a band. They just don’t have the same structure over there because the schools are K-8 and a really small middle school,” she explained. Families are being pushed out of their homes, “some for very trivial reasons like not pulling in your garbage cans in a timely manner and being evicted. And then the landowner charges a much higher amount for a different client because there is so much demand to live in the area … The whole area is being gentrified really quickly,” Palmer commented. However, the schools, students, and the volunteers are not deterred. Willow Oaks now has a violin program and many other schools in the district have begun expanding their own music programs. Palmer has seen firsthand the concert’s impact on the children and their interest in music. “I know they remember it because I walk on campus, and I’ll see current third and fourth graders come and throw their arms around me,” she recalled. Andrea Palmer (right) holds a ram’s horn to demonstrate the original modern brass instruments. Credit: Andrea Palmer. Marginez recalls how his band room of about 20 students at Ronald McNair “was a lot smaller. [They] didn’t really have a lot of instruments, just the standard ones. It was just a portable, really small, but they didn’t really have a lot of students,” he said. Although there were plenty of flutes, trumpet, trombone, clarinet, and saxophone players, he didn’t think they had any tubas or string instruments. However, Marginez loves music. “I like hearing music from a clarinet or flute. It just sounds beautiful,” he exclaimed. Frightened or not, he is determined to learn and get better. After the clarinet, he hopes to play other instruments too, “I want to learn how to play the piano, flute, trumpet — just learn how to play a lot of instruments and play them well. All the instruments if I can,” he said with a smile. Felipe Marginez looks up and smiles at me after playing a few notes in band class. Credit: Kumali Schoen / M-A Chronicle. 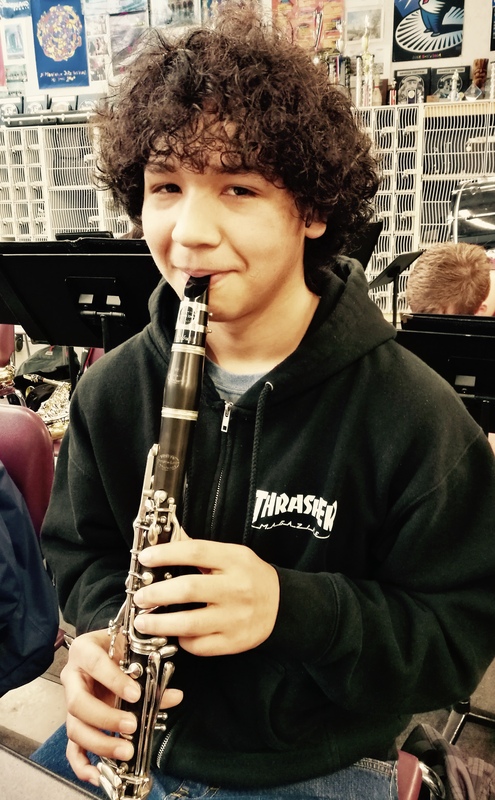 While Marginez loves music and is determined to succeed with the clarinet and many other instruments to come, he is motivated by another reason as well. “I wanted to continue in M-A because my mom likes music, and I just one day want to play for her,” he said. His musical mother never got the chance to play an instrument when she was a child. She “just really enjoys music and she wants to know what instruments make the different sounds,” said Marginez. No matter where they come from, whether volunteer, teacher or student, they are all connected by a common purpose — to share the beauty of music with others. Kurrus, as music consultant, works to provide children in the RCSD a chance to play in a band. This opportunity will develop collaboration skills and help close the division at M-A. Palmer introduces students to various songs and instruments with the hope they will grow a well-rounded appreciation for it. One day they can soon play an instrument they love. Finally, Marginez fights his fears and bravely challenges himself in a rigorous band. He will learn more instruments and play for his mother one step at a time. Hi! My name is Kumali Schoen, and I am currently a sophomore here at M-A. This is my first year at the Chronicle, and I am so excited to practice a lot of writing and try different types of stories. Outside of school, I enjoy creative writing, reading, and baking. I also love running for the M-A cross country and track teams. I am looking forward to a great year of helping to keep the M-A community informed!